My husband celebrated a big birthday a couple of days ago. As our tradition dictates, the birthday celebrant calls the shots on his or her big day and the rest of us are happy (most of the time) to oblige. So when my husband decided that it was to be homemade surf and turf, I had no other choice than to make his dream come true. This year for the turf portion, I decided to buy a whole tenderloin, trim it and cut it myself and hopefully be left with a few extra steaks to enjoy later. I did indeed land up with a couple of bonus filets, but I also found myself with about a pound of small tender tidbits from the trimming to use in any fun way I desire. The dog tried desperately to convince me that he needed it, but unfortunately for him his pleas fell on deaf ears. Since we are all suffering a serious letdown from all the birthday/Valentine's Day decadence, I've decided that today we need a little pick me up in the form of Beef Wellington turnovers. The tasty bits of beef and mushrooms that are wrapped up in puff pastry and drenched in a creamy peppercorn sauce are a cheaters way of eating upscale for cheap. I guess Buzz Feed would call this a hack. Tenderloin trimmings may be what I am using here, but I have also used leftover pot roast or small pieces of inexpensive beef that I have braised until tender. This is really a great weeknight dish or an economical dinner party main that will really please all of your guests. So if you are suffering from the post Valentine's Day doldrums, here ya go . . . the cure. The first few steps of this recipe will produce a duxelles which is a mushroom, shallot and herb mixture named after the Marquis d' Uxelles, a French nobleman back in the day. This mushroom mixture is great all by itself, served on toast or crackers, or as a filling for omelettes or ravioli. So, if you are fortunate enough to land up with a bit extra, put a piece of bread in the toaster and enjoy. That's called a chef's treat. Place bacon in a medium size frying pan and fry until almost crispy over a medium high heat. Remove all but a tablespoon of the drippings. While the bacon is cooking, place the mushrooms, shallot and garlic in a food processor and process until everything is very finely chopped. To the pan drippings, add the butter and melt. Once the butter is melted add the mushrooms, shallot garlic and thyme. Cook, stirring frequently, until mushrooms are soft and shallots are translucent, approximately 5 minutes. Add salt and pepper to taste. Transfer to a medium size bowl. Sprinkle tenderloin cubes with a bit of salt and pepper; drizzle with oil. In a separate non-stick frying pan set over medium high heat, saute the tenderloin cubes just enough to give them some color. Transfer to a medium size bowl. Spread the inside of each uncooked puff pastry square with about 1 teaspoon of your favorite Dijon mustard. Spoon a tablespoon (- +) of the duxelles on top of the mustard. Top the duxelles and mustard with about 1/6 of the meat. Dampen the edges of the pastry with water. Pull the edges of the pastry dough up to meet each other, forming a triangle. Press the edges together, crimping with a fork if desired. Brush top and sides with a beaten egg. Place turnovers into the preheated oven and bake for approximately 25 minutes or until golden brown. Don't worry if they break open during baking as the juices form the most delicious glaze under the turnovers which is actually my favorite bit. Yum! Cool for just a few minutes before transferring to a serving plate and topping with Creamy Peppercorn Sauce and serving. Place butter in a medium size non-stick frying pan which has been set over medium high heat. Once the butter is melted and starting to sizzle, add the shallot and cook until it has started to soften which will take just a couple of minutes. At this point add the crushed garlic and thyme leaves and saute for a minute longer. Add the beef broth and bring to a boil. Reduce the heat and simmer until the mixture is reduced in about half, approximately 5 minutes. Add the brandy and cook for another couple of minutes to let the alcohol evaporate and the flavor mellow. At this point add the cream and the peppercorns, smashing the peppercorns up a bit with the back of a spoon. Simmer this mixture until it reduces about in half. A few weeks ago my friend Haley, who writes one of my favorite blogs, Cheap Recipe Blog, emailed me and asked if I'd like to join in on a little event she was hosting for the Academy Awards. 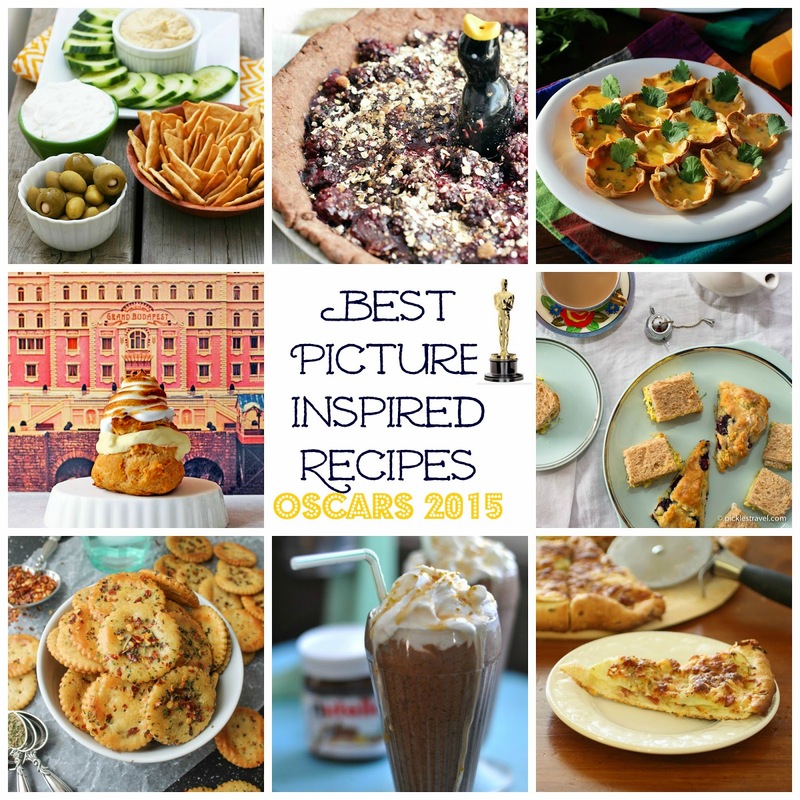 She was looking for food bloggers who like movies, to write a blog post with a recipe that represented an Academy Award Best Picture nominated film that she would assign. Seeing that I am an avid movie watcher, I of course agreed to join in. Now I have to be honest here and say that I believe that this was one of the most lackluster years for movies in a very long while. Usually I try to see every Best Picture nominee so I feel prepared for awards season, but not this year. This year I believe that some of the movies were nominated not because they were really great, but just because there wasn't anything else to nominate. When Haley assigned Whiplash to me as my movie, I accepted it like a big girl. I hadn't seen it and didn't plan to because it just didn't appeal to me. I was kind of hoping for The Theory of Everything or Imitation Game because I had seen them both and they were set in the UK. I had a ton of English recipes and that would have been a walk in the park for me. Even Birdman would have been good, not because I loved the movie, but I had already seen it and between the name and the Broadway setting, I felt the food related possibilities were endless. So the next Sunday I found myself in a darkened theater with 100 or so other movie watchers viewing this "in your face" movie about a talented drummer during his freshman year at a prestigious music school. To say he is challenged by the conductor of a competitive performance ensemble, is an understatement. He is pushed, pulled and twisted inside out by this sadistic instructor along with everyone else who comes near their practice room. Lest you think that I hated this movie, I have to say that I was entertained and did appreciate the twist at the end and found the performances by the main characters dynamic, moving and at times infuriating. I left this movie with the wheels in my head spinning. So thanks Haley, you made me try something new that I would never have seen without your organizing this blogger event. Pairing this movie up with a recipe really turned our to be easier than I thought because like most college students, the lead character in Whiplash loves the pizza at a nearby pizzeria. Since there are a couple of scenes here , I thought that pizza would be a perfect choice. I don't remember if he ever mentioned what his favorite flavor was, but I wanted to do something a bit more sophisticated than your average cheese or pepperoni pizza. I finally decided on potato, bacon and rosemary that I believe would be a great nibble for an awards night gathering. It is easy, just a little bit dressed up, and most of all, golden to fit the theme of the night. I hope you enjoy it. Place pizza dough in the center of a pizza pan or on a pizza peel that has been liberally dusted with corn meal or flour. Stretch dough into a 12" round. Set aside. In a large bowl combine the potatoes, cooked bacon, onion, rosemary, garlic, red pepper flakes, olive oil and salt and pepper to taste. Toss well to coat. Spread potato mixture evenly over the dough. Sprinkle both cheeses over the top. Place in the preheated oven and bake until golden brown, about 20 minutes. In less than a week it will be Valentine's Day. I really love this day because it gives me a reason to stop everything and show the ones I hold dear how much they mean to me. Sometimes I feel that we all take each other for granted, but not on February 14th. Everyone should be made to feel special on this day. Now that we are a little older and have more things than we will ever need or use in this lifetime, my husband and I try to show our love by sharing small, sweet little things that will leave us with memories instead of the task of trying to find a permanent home for them. Mr. H knows that there is nothing I like better than a bouquet of fresh flowers and I know that he looks forward to a special dinner with a decadent dessert and boy, have I ever got one for him this year. I have been wanting to make a coeur a la creme ever since I saw Ina Garten make one several years back. Hers was a heart shaped white cloud spun from cream cheese, heavy whipped cream and vanilla bean, aaahhh, pure heaven. Well, my coeur a la creme didn't come out quite as beautiful as Ina's, but hers couldn't have tasted any better. Unable to find a tear drop or heart shaped strainer, I had to use my round one giving it more of a boule (ball) shape than a coeur (heart) shape, but beauty lies in the eyes of the beholder. So here's an early "I love you" to my beholder. I know that ever since I started this blog over five years ago, he's gotten used to celebrating everything early so I can blog about it before the day. I guess that makes our saying around here, "better early than never". Happy Valentine's Day everyone! Super simple to pull together, this dessert is very reminiscent of a crustless, no bake cheesecake but just a bit lighter. It is great all on its own, but paired with a raspberry or strawberry coulis (like mine here), this is a great ending to a romantic meal. Combine 1/2 cup of the cream with the lemon juice; set aside. Place softened cream cheese into a large bowl. Beat with electric mixer set on medium until it is smooth and whipped Add in the sugar 1/3 at a time, beating well after each addition. Add the vanilla and lemon zest. Now give the cream and lemon juice mixture a good stirring. Add it to the cream cheese mixture and mix it in with the electric mixer set to medium high. Slowly add the remaining cream. Once it is incorporated, turn your mixer up to high and whip the mixture until it is the consistency of firm whipped cream. Set aside. OK, now as the traditional recipe goes, at this point you are to line a mesh strainer (I used my 7 inch mesh strainer) with enough cheese cloth that it drapes over all the edges. The excess will be laid over the top to cover it. You then set it over a smaller bowl to drain overnight. It is important that there be enough room at the bottom so that moisture can drain from it without touching it. Well, mine never did have more than about a tablespoon of liquid at the bottom I don't know if it was the brand of whipped cream I used (Promised Land Heavy Whipping Cream) or the Philadelphia Cream Cheese, but there wasn't much excess moisture to drain from it. After draining, peel the cheese cloth back from the top then carefully invert onto a serving plate. Remove the cheese cloth from the top and enjoy. Serve with coulis (recipe follows). Keep unused portions covered and refrigerated. Place strawberries in a small sauce pan set over medium heat. Stir in sugar and water, lemon juice or limoncello. Cover pan and bring to a simmer. Mash berries a bit with a potato masher, reduce heat and replace cover. Simmer, stirring frequently for approximately 10 - 15 minutes or until berries are soft. Remove from the heat and blend with an immersion blender or in the bowl of a counter top blender until you have a smooth puree.